Believing that painting had become too concerned with pleasing the eye and not the mind, Marcel Duchamp had the idea to fasten a bicycle wheel to a kitchen stool and watch it turn—a move that became one of the highlighted precursors to both kinetic and conceptual art. It seems true to form that with every generation of artists frustrated with their current political climate and the commercialization of art, the direct response seems to always be the same: let’s get weird. Whether it’s 1913 in Zurich or 2017 in, well. . . anywhere. Greer’s work fits within all of Dada’s expectations for frustration, utilizing tools found in everyday life, and fighting the bourgeoisie. There’s is also a lovely sense of gratitude for the earth in juxtaposition to frustration for societal expectations. The five works that were presented were— well— acceptable. The readers seemed nervous rather than righteously angry. This wasn’t an act of rebellion— it was an over-intellectualized, not curated, group of readings— distinctively not Dada. Huffman took his understanding and appreciation of a movement within the western art canon, much admired for its buoyancy and timelessness, and attempted to apply it to contemporary issues that are old as time but begging for a new solution. An image of english graffiti documented in Roger Perry’s The Writing on the Wall (1976). Graffiti found and documented on or around a crumbling 1970’s London. Author / Photographer unknown. After the regularly scheduled readings Huffman opened up the floor to the audience for a regularly scheduled (from my understanding) open mic night. The audience contained several locals, and one traveling participant ended up contributing to the event in a way that Huffman clearly wasn’t expecting. For the sake of privacy for these individuals whom I’m sure did not plan on being reviewed I will not be listing their names, or even referencing their works; because that isn’t the point. The point is that an aspiring curator felt the obligation to create an avenue for locals to write, collaborate, analyze, discuss art history, as well as discuss contemporary issues in a public forum that wasn’t a gallery. This act is important and needs to be repeated. Over and over again. The Cabarete Voltaire was (and is) known for its ability to gather like minds for discussion, debate, and call to action. Here is my challenge to Huffman to understand that his idea to curate an event such as this is important— but he needs to feel responsible for repeating it— and letting go of some of his power. I disagree with Huffman’s intention of curating a night of ‘Dadaist Slam Poetry’. The mere construct of curation is somewhat antithetical to Dada, but I found that Huffman’s timing couldn’t have been more perfect. I thought that his objective in organizing such an event showed a keen socio-cultural sensitivity and skill of observation; although I was disappointed to learn that he was unaware that Kentucky was fertile ground for Dadaism with such influential figures as Elsa von Freytag-Loringhoven (aka Baroness Elsa) on a farm not far from University of Kentucky after her stint in New York; and of course Kentucky’s rich tie in to the Arts and Crafts Movements, which included involvement in Arte Povera Movements and the like. I also felt that though Dadaism was a great lens in which to examine such an evening, it wasn’t contemporary enough. Dada provides a framework for viewing, but contemporary propagators of art, criticism, and philosophy need to take the reign and develop something new. 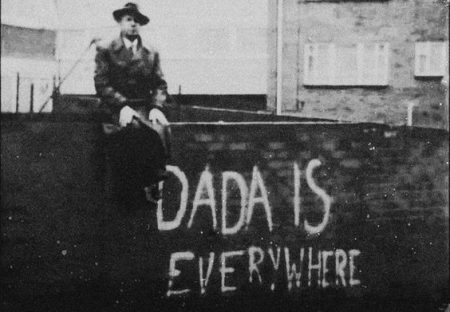 Dadaism had a hand in a long list of movements throughout the 20th and 21st centuries: Conceptual, Political, Identity, and Casualism among others. As a citizen of this version of the United States that was capable of voting Donald Trump into office, the most absurd thing we can do is educate and communicate with those who don’t have the capability of learning about the importance of art in a traditional setting. This means leaving the galleries. This means leaving the library. This means leaving the studio. It means inviting people in. The best way to criticize and satirize our government is by demanding to be a part of its solution.